Lockout is exactly the kind of high-concept ridiculousness that we've come to expect from French action maestro (fun with languages!) Luc Besson: It's the year 2079, the United States is still a thing, and the President's daughter is being held hostage aboard a... wait for it... prison... in SPACE! And here we have the film's first (and perhaps most fatal) flaw (and there are many): the title. Why not just call the thing SPACE PRISON (caps necessary) and be done with it? 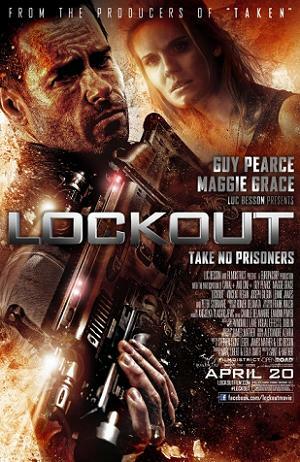 Lockout implies a dark and gritty film (this is neither); SPACE PRISON implies ludicrous fun (which this definitely is). In terms of Besson, this is more Fifth Element than Léon. In the Bruce Willis role this time around is Guy "Not Val Kilmer" Pearce. His character -- Snow (yup) -- amalgamates Willis' hard-luck loutishness and Brad Pitt's rakish 2nd-best, with just a pinch of Snake Plissken thrown in. Snow is the guy tasked with saving the aforementioned First Daughter (there's also something about a briefcase -- possibly the laziest MacGuffin in cinema history). Thankfully, he has quite a bit of fun with the cliched "only man for the job" role -- Snow flits from frying pan to (SPACE!) fire with the kind of maniacal glee that Besson (cowriter and producer here) usually saves for his villains. He takes the buckshot approach to one-liners, and a good number of them hit. He also establishes an easy rapport with co-star Maggie Grace (not terrible, which is the equivalent of Oscar-worthy considering the caliber of supporting talent) and generally does his best to elevate obviously weak material. Shoehorned into the usual Gary Oldman villain role is a strangely restrained Peter Stormare. If there was ever a movie to unleash Stormare's Oldman-esque psychopathy (does anyone else remember his performance in an otherwise-awful The Brothers Grimm?) SPACE PRISON (er, Lockout) is it. Instead, he is confined to a role that's more Commissioner Gordon than Zorg as the somewhat shady head of the Secret Service. He meanders from scene to expository scene, rarely even so much as emoting or changing the tone of his voice. "That Guy" All-Star Lennie James is serviceable as Snow's confidante, and the two blokes who play the film's (randomly) Scottish (or Irish?) villains seem to be having a good time, but but didn't seem to get the memo that this wasn't a direct-to-DVD job. Worse still are the rogue's gallery of stiffs that play the bit parts -- random prisoners, scientists, Secret Service agents, even the role of the President himself (one of the worst moments of acting I can ever recall seeing is when the President finds out his daughter is being held hostage -- the movie might be worth seeing just for that little chestnut). I know the film only had a $20 million budget and was filmed in Serbia, but come on. The budget deficiencies are even more apparent in the CGI (not even worth talking about, although you have to commend the effects editors for doing all they could with Microsoft Paint -- an early motorcycle chase scene stands out as especially cheesy). Speaking of budgets, whoever built the space prison clearly cut corners (let's just say it clearly wasn't Japanese or German). Radiation leaks inconveniently pop up to thwart our heroes, guns are easily snuck past security checkpoints, there is a minor problem with its orbit may or may not send the whole thing crashing into the Eastern Seaboard, and, oh yeah, THERE IS A BUTTON THAT RELEASES EVERY SINGLE PRISONER AT THE SAME TIME. Why would anyone design that button, ever? (The far superior The Cabin in the Woods suffers from a similar... wait, the exact same, issue, so even supposed "smart" filmmakers like Joss Whedon are not immune from moronic movie tropes). In short, Lockout (aka SPACE PRISON) is a profoundly stupid movie (wait until you see how Snow and the First Daughter escape said space prison), but not one without its charms, and one that I will definitely be buying on DVD (but only as soon as the local used record store has it for, say, five or six bucks, tops). This is not one of Besson's finer efforts -- some blame can definitely be placed on the writing, but much of it lies in the microscopic budget (and I'm assuming a good chunk of it went toward whiskey for Stormare) and uneven directing -- this is Mather and St. Leger's debut feature. While much of the entertainment value in Lockout may be unintentional, you could do much worse on a lazy Friday night with a six-pack of beer.